Digital Marketing is the present and the future of Marketing. I am glad you want to be part of the ever-growing digital marketing industry. Digital Marketing refers to advertising through digital channels such as search engines, websites, social media platforms, video sharing platforms, email and even mobile apps. Digital Marketing is​​​​​ any form of marketing involving electronic devices. Traditional Marketing techniques including billboards, flyers, Television ads etc. are not as effective as they once were. Do you think Billboards have future? I think no, Definitely not. According to a survey, on an average, people in Singapore spend about astonishing 12 hrs 42 min a day on their Digital gadgets. Americans, on the other hand, spend about 5 hours a day on mobile devices. This stunning info-graphic by MediaKix.com show how people spend their time on the social media. According to Internet World Stats, there are now more than 3.8 billion internet users as of June 2017. Internet users have seen a stunning growth of about 976.4% since 2000. China and India lead the charts for highest in terms of Internet users and one of the reason is their vast population. In Asia, Japan has the highest penetration rate of about 94%. Whereas countries like Singapore and India have penetration rates of 81.2% and 34.4% respectively. The number will go on increasing and that's why businesses will have to move away from traditional marketing to Digital Marketing. Unlike traditional advertising on TV, running a digital marketing campaign is very economical and fast process. Even a young entrepreneur with a small budget can afford it. In fact, you can even start without any cost. Whereas running a digital marketing campaign is very economical and fast process. Even a young entrepreneur with a small budget can afford it. You can even start without the budget. And that's true. In just a few days, your ROI (Return on Investment) will become visible to you in digital marketing whereas Traditional marketing will takes months for it. The most important thing is results. Agree? And this is where digital marketing has a big advantage over traditional Marketing. In digital marketing, you get to see the results and insights in real time. On top of that, you’d be able to understand what works and what doesn’t, and decide instantaneously whether to carry to with your campaign. Unlike traditional marketing, the results could even take several months for results to show. Digital Marketing allow you receive critical information and insights about your audience such as their age group, geographic location, interest and user behavior. These information would allow you to focus on a specific group and plan your digital marketing campaigns strategically. Again, this is one of the biggest advantages of Digital Marketing as it allows you to create a more meaningful connection with the audience that traditional marketing doesn't allow. The potential clients and customers can contact on different platforms with the company in case of any query. Now with the introduction of Chat bots, customer service process is getting more automated and immediate. Digital Marketing, takes the lead in publicity. Hands down. In digital marketing, even a single post can go viral and it engages with a new visitor every second. In digital marketing, your product can be assessed from anywhere including their smartphones and we all know how important is our smartphone to us. Now people spend about 5 hours per week shopping online. And e-commerce industry is responsible for about $2 trillion in annual sales. Search Engine Optimization or SEO is a digital marketing tactic which you can generate traffic from search engines platforms such as Google, Bing etc. It is important that every online marketing should have good knowledge of SEO. The ultimate goal is to attract customers using search engines when they search for any software or service related to what you offer. SEO doesn't cost you anything unless you hire someone to do it for you. Google processes about 3.5 billion searches per day and 1.2 trillion searches per year worldwide. Now you can understand how crucial can SEO might be for your digital marketing efforts. Pay Per Click or PPC in which you pay the publisher every time your ad is clicked. One of the most popular PPC networks is Google AdWords. For most of the advertisers, this is one of the most important tactics for their digital marketing efforts. You can tailor your ads that are targeted to a particular audience and for specific search terms. You can see AdWord ads in action when you search for any keyword. These ads usually appear at top of the search results. Nowadays, social media has become an integral part of our life. Agree? Facebook alone had about 2 million monthly active users as of 2017 followed by YouTube and WhatsApp. Promoting your brand on social media is very important to increase your brand awareness, getting traffic, loyal followers and ultimately generating sales. It's important to share something that is valuable and engaging which would encourage people to share organically. Social Media is a powerful lead generator for your business. The popularity and users of social media platforms such as Facebook and Twitter is only growing; making them the preferred channels/platforms among brands and businesses. Content marketing is still considered Big Thing in digital marketing, by many. Content Marketing is the creation and promotion of content for promotion of the brand, traffic, leads and ultimately customers. It involves providing valuable and engaging content to the customers which helps in search engine optimization. Email marketing is a more direct and targeted approach to reach out to the customers. It allows businesses to promote content and offers discounts and sharing event details with the customers through e-mail. We all check emails very frequently and that why it very useful technique in digital marketing. As mobiles are becoming more and more integral part of our lives. You can reach out to possible customers either by SMS, MMS or by more popular approach i.e using mobile apps. Affiliate Marketing is paying a publisher for every customer they bring in. Most advertisers use various platform for affiliate marketing like CJ, Share-a-Sale etc. The commission can be in the form of gift rewards or money. They work quite well for the both small and big business. Marketing automation is a software that ties all your marketing efforts together. It has a goal of automating marketing efforts by automating certain tasks such as social media, emails etc. It helps you get insights on which programs are working and which aren't. You need to adopt digital marketing as soon as you can. With digital devices becoming a part of our lives, there is need to learn how you can take advantage of it. Do let me know what you think in comment section! 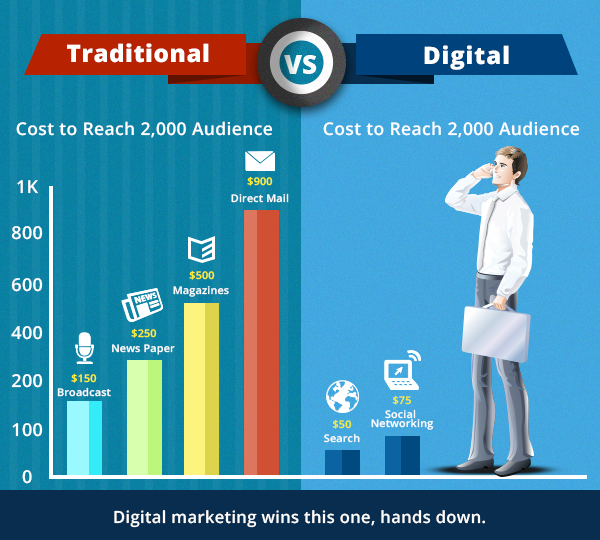 Digital Marketing vs Traditional Marketing. I would rather go for Traditional marketing.